It happened that two very dear friends in their 50s from different circles in my life were both scheduled to undergo emergency radical mastectomy on the very same date, at the same hospital on the same floor. Both women were/are artists of exceptional talent and passion. Neither of them was born into a Jewish path, and both chose that path quite early in life, experiencing it not a conversion but as a spiritual homecoming. These two individuals had never met. Independently of each other, they each revealed to me the innermost meaning of their ordeal. Each expressed directly to me that, in a profound way, the surgery represented a healing of The Holocaust. This meaning- making on behalf of the greater good is the heart of ultimate healing. My intention in painting was to honor and magnify their intentions. My process was to meditatively join them in entering the deepest river of healing on behalf of the Collective/Community. I began the painting on the eve of the surgeries and completed it during the post- operative recovery period. Every single brush stroke forms a Hebrew letter (print or cursive). 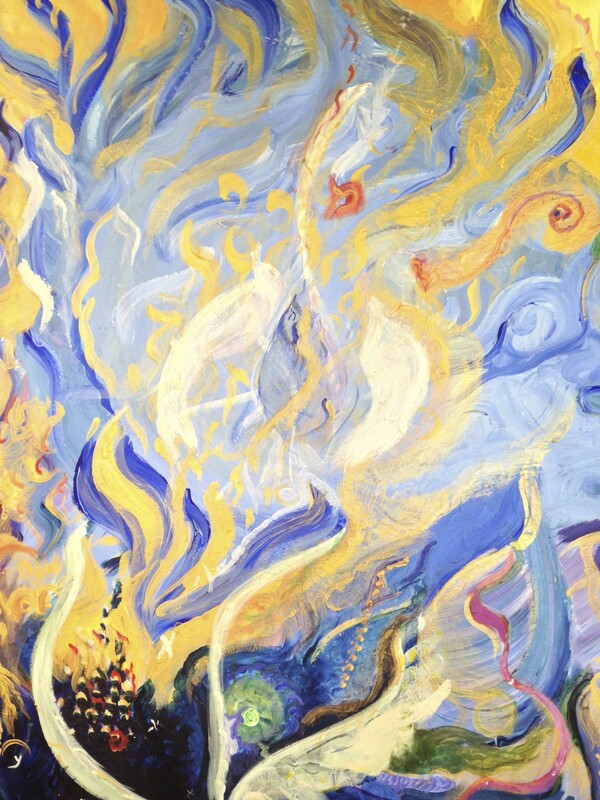 This was done as a meditation on the mystical teaching that each soul is an emanation of a letter of the Living Torah. While the overall flow of the canvas is from the dark to the light, the light predominates to emphasize a healed outcome. The heart of the image indicates the eye- of-the -needle specificity that is at the core of any deeply transformative healing. Olga Sem Creates Healing Masking With Mystical Characteristics Representing People Who Have Crossed Her Path In Life.